Five goals in nine minutes against VfL Wolfsburg last term, Robert Lewandowski had to settle for a brace this time around. 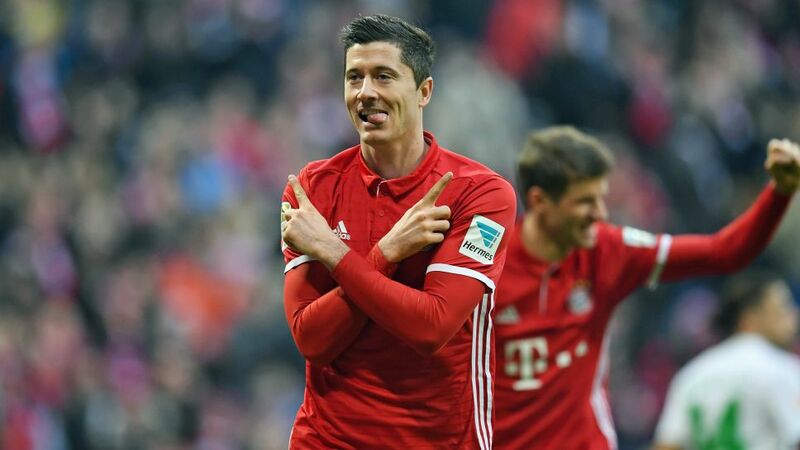 Robert Lewandowski struck twice as FC Bayern München reclaimed first place in the Bundesliga with a resounding 5-0 win over VfL Wolfsburg. Lewandowski has more Official Fantasy Bundesliga than anyone else in the game!. Sign him up here! Lewandowski broke four Guinness World Records when these teams went head to head last season, and although the history books were safe on Saturday, so too was Bayern's result, thanks in no small part to a brace from the Poland captain. Lewy turned home two predatory finished either side of half-time as the Bavarians went top, but did he do enough to win your vote for this week’s #BLMVP? Vote Robert Lewandowski for #BLMVP on our Twitter channel now! Scored his tenth and 11th goals of the season with his fourth brace of the current campaign.It was the 34th time he has scored more than one goal in a single Bundesliga game.With 132 Bundesliga goals, he has overtaken Michael Zorc and Rudi Völler into 21st place of the most prolific Bundesliga goalscorers of all time. Head to the Bayern-Wolfsburg Match Centre for more on this fixture.